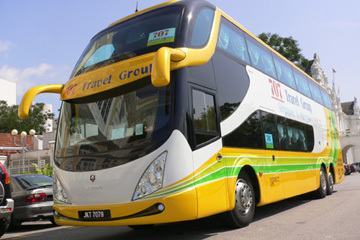 Having started its operation in 1953, 707-Inc Group is one of the most sought-after bus companies across the South Region of Peninsular Malaysia, Singapore and Indonesia. Starting off the business as Great Excursion Travel Pte Ltd in the year 2002, 707-Inc has been operating the Singapore inbound tours and coach chartering services with much success to receive its recognition that they deserve today with 63 years in the business. 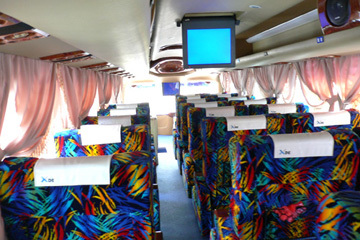 With that many years of experience, the company’s transportation and communication from Penang, Malaysia has a large amount of experience in the bus operation. You know the coach captains are in good hands when they have such a reputable leader that is respected in the travel industry. Quality is 707-Inc Group’s main priority as property developers as they aim to deliver trendsetting concepts for the consumers while reinforcing the values of reliability commitment and forging long-term relationships with their patrons as a trusted quality brand. The strong use of green for its logo represents passion, stability and a firm commitment to their customers, 707-Inc proves to live up to its standard to making their patrons their number one priority by being committed to the comfort and being responsible. The company name and logo represents the roots of their preserved long heritage that is unified and being in the win-win situation. The bold colours represent the boundaries interconnecting relationships of Singapore, Malaysia and Thailand through the spirit of their services — this is being displayed through the colours red for bravery, yellow for strength and light green for passion. 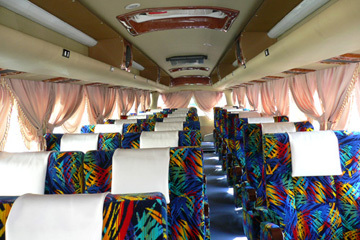 With free and easy tour packages available to choose from – as well as providing overland tours to Malaysia using Malaysia registered coaches – it is no wonder they are on top of the game with the rest of the bus providers available.707 Travel Group has also established a regional tour department that provides guided tours to various states in Malaysia so they stand out as a more powerful rather than just being known as a regular bus operator. As the company is also a property developer, they believe in producing top quality projects with transcending concepts to the ever-changing needs by the consumers. There are over 300 bus routes moving an everyday basis, 707-Inc gives you a great selection of tour and express buses that leave from Singapore to different amazing places in Malaysia. 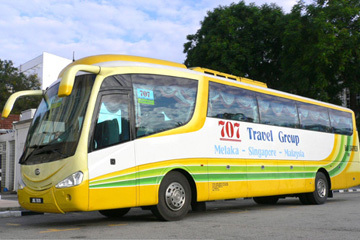 The most common and popular route would be buses departing from Singapore to Melaka with over 150 routes per day, and over 50 routes per day from Melaka to Singapore. Then there is the Singapore to Genting Highlands route with over 30 trips per day. All 707-Inc buses come equipped with air-conditioning system, television and luggage compartments to accommodate their patrons for a relaxing journey to their destinations. There are a couple of selection of buses that you can choose from. You can get the regular 27-seaters single deck, 30-seaters single deck or the 45-seaters double deck buses. Rest assured they come with sufficient leg room and comfortable seats for you to have anenjoyable ride without any fuss. Most importantly to know, the 707-Inc bus drivers are well-trained to ensure the safety of the passengers which is the company’s utmost importance. 707-Inc has made Malaysia their biggest destination attraction especially during holiday season. Malaysia has become one of the most ideal countries to visit for anyone in the world, hence the tight knit between the country and Singapore. The diversity and colourful festivities are good enough reason to make Malaysia one of the leading attractions in Southeast Asia. The North-South Highway has even made the traveling smoother than ever for patrons. 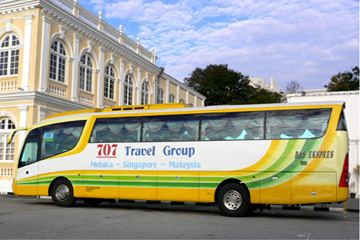 Besides that, 707 Travel Group headquarter company Great Excursion Travel Pte Ltd have major businesses in both Singapore and Malaysia. With daily departure tours to famous destinations in Malaysia such as Kuala Lumpur, Genting Highlands, Cameron Highlands, Sibu Island and Tioman Island. You can also find exciting attraction tickets to some of the most popular spots to visit in Singapore or booking a hotel and flight at the same platform as well. 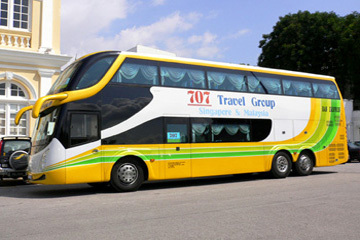 It must be highlighted that the 707-Inc bus company is a member of the National Association of Travel Agents Singapore (NATAS) so they are steadfastly providing dependable and reasonable tour packages to the patrons who are interested. The bus company also received the Great Bus Conduct Award and Top Tours & Travel Agent Award. 707-Inc offers a warm and friendly service to ensure your travel experience is a pleasurable one. Join the 707-Inc Group membership on its website as well if you are looking for special offers on your travels and other promotions to concerts. Book a ride with 707-Inc bus now at easybook.com. 33-G-11, Kompleks Prangin Mall, Jalan Ria, 10100 Penang, Malaysia. No. 26, Medan Simpang, 34700 Simpang Taiping, Perak, Malaysia. G31, Jalan PM5, Plaza Mahkota, Bandar Hilir, 75000 Melaka, Malaysia. Larkin Bus Station 5, Jalan Garuda, 80350 Johor Bahru, Johor, Malaysia.